Historically, my relationship with sunscreen has been sketchy at best. Throughout my teenage years, and well into early adulthood, slathering on SPF every day felt like swallowing a big vitamin with a gross aftertaste: I knew it was good for me, but I still dreaded it. And rightfully so, because unlike the luxe moisturizers, primers, and face masks I proudly coat my face with, sunscreen hasn't always been so glam. Not every sunblock is flattering on brown skin — a pasty complexion is a definite no-no. Beyond chalkiness, there's also the question of texture; some formulas are incredibly greasy, while others zap the moisture out of dry skin. But any dermatologist would preach that sunscreen is the key to healthy, well-protected skin — even more so if you're like me and struggle with hyperpigmentation. Some formulas have been decent enough for me to pull out occasionally, but very few have made me excited to put on (the doctor-recommended amount of) SPF every day — until Specific Beauty's Active Radiance Moisturizer came into my life. This SPF 30 lotion, from a dermatologist-formulated brand designed specifically to treat hyperpigmentation, is a gem. It's oil-free, lightweight, and isn't tinted, but leaves behind a sheer gilded glow that ever-so-slightly illuminates the skin. No flecks of glitter, no greasy cast — just imagine if a drop of your favorite gold highlighter was blended in with your favorite nourishing face cream, and you'll get an idea of what this moisturizer has to offer. 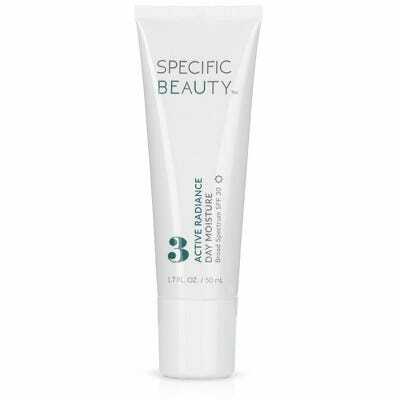 What makes it even more impressive is its other benefits: In addition to defending skin against sun damage, niacinamide and licorice-root extract help to soothe irritation and correct unevenness — not to mention the lit-from-within glow you get when wearing it under foundation. Now, whether I'm embarking on a full face of makeup or just running errands, I never make a move without putting on this moisturizer first. Better weather is on the horizon, and come summer I'll also be applying it to my chest and arms for a naturally-highlighted look. I wouldn't say no to a body version of this sunscreen (ahem) but, until then, I'll be stocking up.